The sacred juniper forest of Reting (30°18'N/91°31'E) forms the westernost occurrence of forest, an outlier of c. 6 km width beyond the western margin of the east Tibetan forest zone. The forest is surrounded by shrublands and pastures more or less devoid of trees (photo 1). The existence/survival of this forest is due to the buddhist/monastic tradition: it is said that monks and nuns were the first to establish „nature reserves“ in Tibet, in a defined area around the monasteries, where all elements of nature were to be protected. Woodcutting, burning and hunting were forbidden. Travellers in the 19th and early 20th century still observed wild larger mammals in these groves, extinct or extremely rare elsewhere (photo 2). 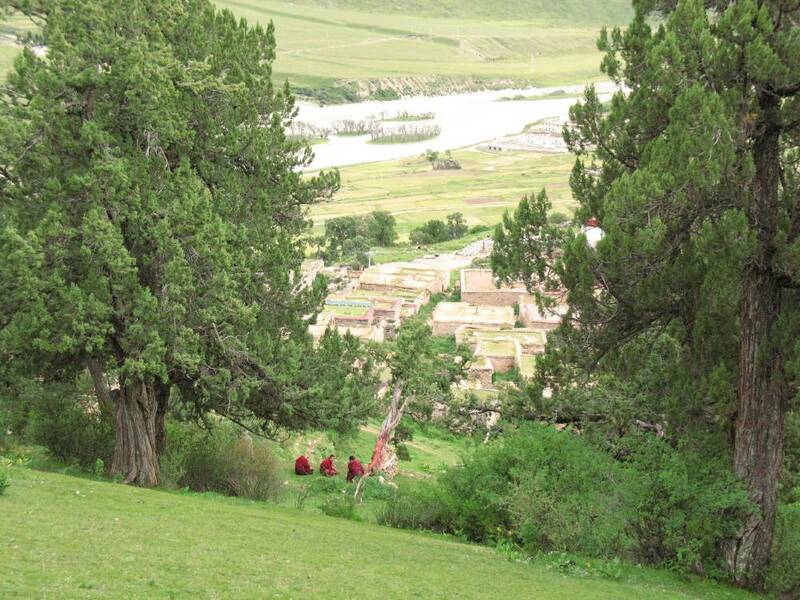 The same applies to the juniper tree species forming the dry margin of the east Tibetan forest zone: relict trees and groves are almost exclusively confined to monasteries or sacred sites above villages. The juniper forest in Reting is constituted by the tree species Juniperus tibetica Kom., single- to multistemmed trees reaching 12 m at the foot of the south-facing flank (4200 m a.s.l.) and 3-4m at the treeline (4750 m a.s.l. )(Photos 3-6). The sacred forest harbours the monastery (photo 1), several retreats and a number of sacred sites, most prominent being the chorten along the prayer circuit (Photo 7). As also the mountain peaks around, the trees are believed to house spirits and deities. They are therefore worshiped and decorated with prayer flags (Photo 8), kathags (Photo 9) and gifts. Trunks of special trees may be painted in red, as the monastrey buildings and the monks´ robes (Photo 10). Foliage and bark of the trees are used as incense, the seeds are used to make chaplets (manufactured in the monastery). These uses lead to the traditional threats of the forest: even when woodcutting is prohibited, the vitality of the trees may be harmed by excessive use of these products (commercialization in the course of pilgrimage and tourism). The greatest threat to the forests is, however, the strong year-round grazing by domestic livestock, especially yak (Photo 3). The golf-lawn appearance of the herbaceous vegetation is due to the strong grazing. Even though yak do not selectively eat juniper seedlings, they will be grazed by hazard or trampled down. Germination is plentiful, but hardly any seedling becomes taller than a few centimetres. Obviously grazing was practised since long in the Reting forest; in consequence the forest is overmature and regrowth almost missing. Not only by warfare (last in the Cultural Revolution) but also by the gradual die-off of overmature trees, the forest became open in its oldest parts (Photos 3-5, 8, 10). Recent scientific research aimed at investigating the decisive factors for missing tree regeneration: 18 years of grazing exclosure could not prove that grazing is the main reason. Other factors like drought, competition by herbs (ungrazed plots, Photo 2), consumption by small mammals, are yet to be investigated. Photos were taken during research visits. More information and scientific references obtainable from the author.